Graduated from University of Strathclyde with BA (Hons) in History and Sociology. Earned PGDE from University of Strathclyde in 2009. My name is Amber Allan and I work as a primary teacher in London. I attended high school in Lanarkshire and, although I was inspired by teachers there, I made the wrong subject choices and lost interest. After leaving school early in fifth year; I worked as a receptionist, party hostess, customer service rep and a barmaid. I heard about SWAP from friends, so after working through a difficult period of my life, I decided to focus on the future. Looking back to my school days, becoming a primary teacher was always my dream, but I didn’t think that it would be possible to achieve it. That was until I heard about SWAP from friends. The nearest SWAP Primary Education Programme was too far from my home, so I applied instead to study Access to Humanities at Motherwell College. I found the lecturers there to be supportive and understanding. I developed a love for Scottish History at Motherwell College, inspired by a passionate lecturer, Mary Barrett. As SWAP classmates, we also supported each other during the year and were there for each other in times of both happiness and stress! I was accepted onto BA (Hons) in History at the University of Strathclyde and I particularly enjoyed studying Scottish History and World War Two. Of course, there were challenges like essay writing and exams at university, but I relished learning in the university environment. I admired my lecturers and made many new friends. Any stresses were quickly forgotten upon graduating! 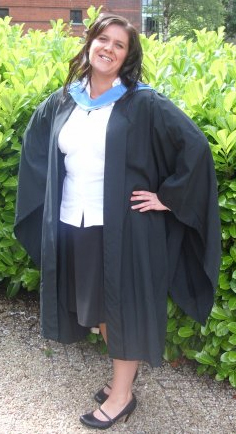 I remained at Strathclyde to complete my PGDE in Primary Education, in which I was in my element! My probationary teaching year was spent in Fauldhouse, West Lothian and I finished with glowing reports from my head teacher, mentor, HMIE and pupils. I also won an enterprise award from West Lothian Council for a Fair Trade project with P6 pupils. Next, after an out of the blue opportunity, I taught for a year in Barcelona, before taking up my current teaching post in Croydon, London. I love my job and I have grown so much since making that decision to return to education many years ago. There is nothing else in the world I would rather be doing. I would never be where I am today if it wasn’t for SWAP. It gives you the knowledge, confidence, skills and opportunity to go further. For me, it was the starting block to getting the job that I really wanted.